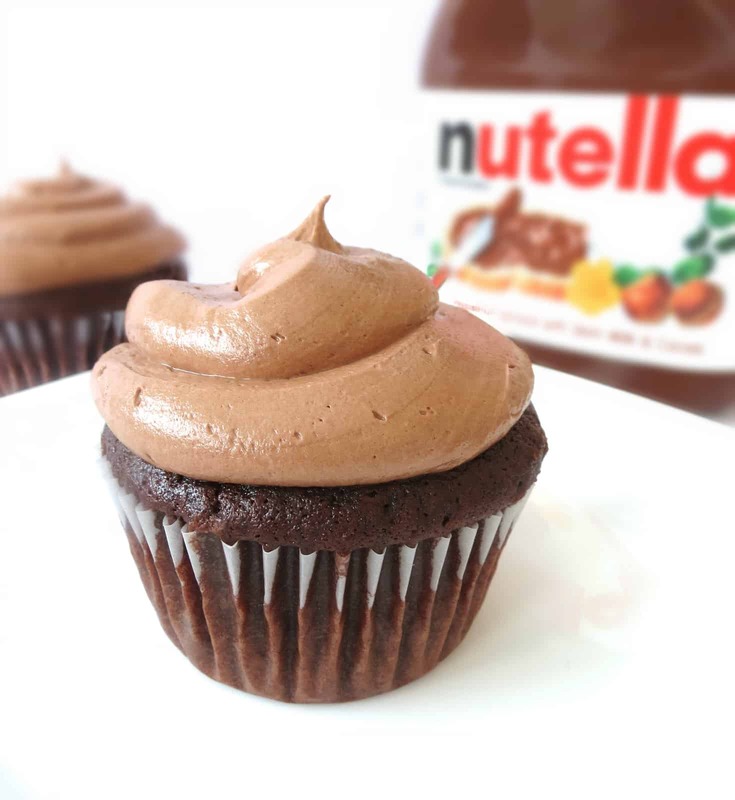 I don’t think there is a better combination than chocolate and nutella. These cupcakes are intensely rich and chocolatey which is extremely hard to find. With the addition of coffee, it really brings out the flavor of the chocolate. I must have baked 50 batches of different chocolate cupcake recipes and I still didn’t seem to be happy with the result. Until now! Woohoooo, my perfect chocolate cupcake searching days are over! The frosting… UGH. This frosting is the best frosting in the entire world. It’s so creamy and soft and soooo addicting!! I could have eaten the entire bowl myself. 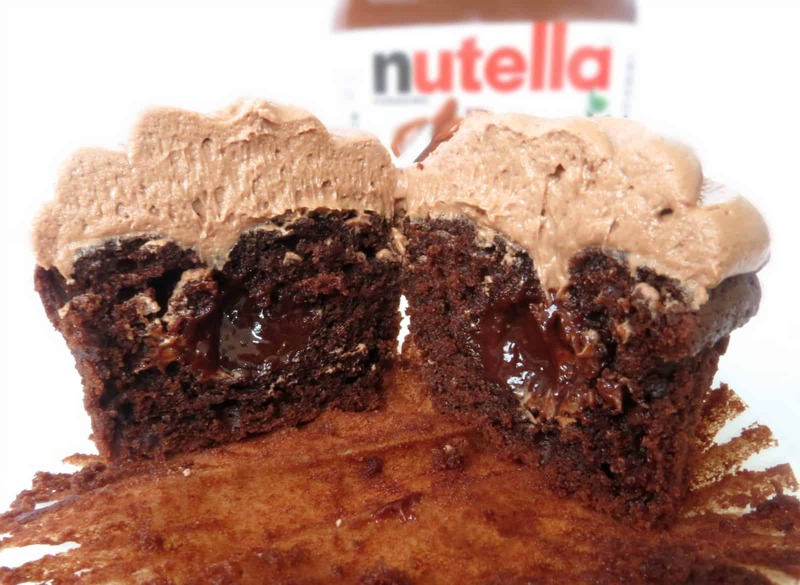 It’s like a fluffy nutella cloud in your mouth. Delicious. Oh, did I mention there’s a chocolate ganache center? Yes. Ah-mazing. The trick to this is, after you scoop your cupcake batter into the liners, you put a dollop of cooled ganache in the center of each cupcake. It’s like magic. The batter bakes over the ganache and you have a melty, gooey, chocolatey center. YUM! There may be some spots on top where it didn’t completely bake over, but you’re just going to cover that up with some frosting. I ate one of these babies and was in chocolate/nutella HEAVEN! I will definitely make these again and again. And again. And again. 2. In the bowl of a stand mixer, combine butter and sugar together until completely incorporated. 3. Melt the chocolate and let cool for a minute or so, then add to mixer on low to combine. 4. Add the eggs and egg yolks until combined. 5. Mix in the vanilla, oil and sour cream. 6. Sift together the cocoa, flour, baking soda, and salt in a separate bowl and then add into the mixture. 7. Pour in the cooled coffee and mix until everything is combined. 8. Fill your cupcake liners and set aside to prepare the chocolate ganache. 1. Heat chocolate, sugar and heavy cream in microwave for about 30 seconds. 2. Mix together with a spoon until combined. 4. Then, go back to your cupcake batter in the cupcake tin. 5. Place a dollop of ganache into the top center of each cupcake. 6. Bake for about 20 minutes or until toothpick comes out clean. 1. Using the whisk attachment, cream together the butter and nutella. 2. Add in the sugar and salt and mix on low speed until incorporated. 3. Add in the heavy cream and vanilla on low speed. 4. Whisk the frosting on medium-high speed until light and fluffy. 5. Frost cupcakes when they are completely cool or frosting will melt!